Kinshasa 31 January 2008 (UNHCR) - The number of repatriated Congolese refugees from Tanzania with the assistance of the UNHCR has now exceeded 50,000. This was reached on Tuesday 29 January last when the chartered ship, MV Mwongozo, left the Tanzanian port of Kigoma on Lake Tanganyika with 184 refugees on board. 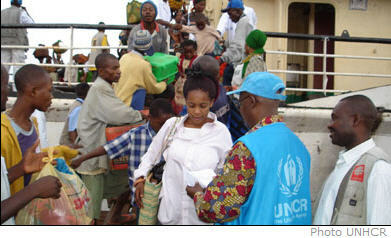 Kengeta Kiza was officially indicated as the 50,000th Congolese refugee repatriated by the UN refugee agency since October 2005, when the UNHCR started the voluntary programme. The final destination of Kiza, a young woman of 26 years of age who was traveling with her six children and her old mother, was to the town of Dine in South Kivu province, after spending the last 10 years in Lugufu camp in Tanzania. The refugees boarded MV Mwongozo after a three hour road voyage from Lugufu camp to Kigoma port, to make the nine hour lake crossing to Baraka in South Kivu. ”It is at the same time a joy and a sadness,” declared the UNHCR assistant operations officer Judy Cheng-Hopkins, who was a guest of honour at the departure ceremony. “It is marvellous that we can help them return in safety and dignity, but they will be confronted with several challenges on their arrival,” she added, as Congolese dancers danced while others sang songs of peace and hope. The returnees received assistance packages upon their arrival in South Kivu, consisting of household items such as plastic covers, buckets, cans, mosquito nets, agricultural tools and food supplies for three months. In addition to an assistance package and transport for the refugees, UNHCR is involved in reconstruction assistance, in the promotion of income generating activities and rehabilitation of infrastructure, including health centres and schools, to facilitate the reintegration of the returnees. In spite of a dubious future, Kiza was optimistic on the ides of returning home. She recognised that it was a big challenge, but she said that she had a brother and other family members awaiting her return to the DRC. “I am grateful to the UNHCR because I was able to return under good conditions,” she added. Presently there are nearly 100,000 Congolese refugees registered in Lugufu and Nyarugusu camps in north western Tanzania. Other refugees live outside the camps, and in total there are 300,000 Congolese refugees in various countries of asylum.